A senior executive at HSBC has been named Singapore's top bank executive for service at a ceremony last night. 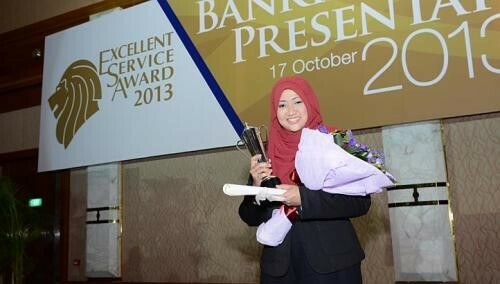 Ms Seri Rahayu Mohd Shaikh, the assistant vice-president of customer experience, beat six other nominees to be crowned the Service Excellence Champion at the event at the Raffles City Convention Centre. The award criteria include service attitude, handling difficult situations and helping improve service, as well as the nominee's appearance and personality. Ms Seri, 36, started her banking career at HSBC 16 years ago, working her way up from being a clerk to her current managerial position. She said that being able to soothe the nerves of angry clients, and helping them to stay on as happy customers are the best parts of her job. "Quite ecstatic! This is also a win for HSBC and I hope it will spur more banking service ambassadors to strive to do their best for their customers." UOB branch manager Tan Puay Joo was named the first runner-up and DBS Treasures private client assistant relationship manager Ivy Chen the second runner up. The awards honoured more than 3,000 local bank staff for excellent customer service. The director at the Association of Banks in Singapore (ABS), Mrs Ong-Ang Ai Boon, noted that banking staff have a more difficult job now as customers have become more demanding while regulatory requirements are more complex. "It is important that we don't lose sight of the reasons why people chose to bank in Singapore in the first place - and constantly strive to maintain the high standards that are the hallmarks of our industry," she said. UOB received 865 awards, the highest number this year and the third straight year it has led the other banks. Ms Wendy Teo, head of group channels at UOB, said: "Only by serving customers with their best interests at heart can we develop lasting relationships that allow us to help customers with their lifelong banking needs." The Excellent Service Award was launched in 1994 to recognise individuals who have delivered outstanding service and to develop service models for staff to emulate.